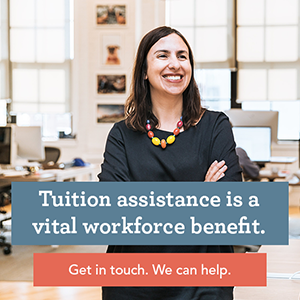 Does your organization offer an education assistance program — a scholarship or tuition assistance program, for employees or employees’ children? It’s a terrific benefit, but one aspect is often overlooked: making sure your employees know about it. In many cases, employers tell employees about an education assistance program when they’re recruited or hired, but don’t make it top-of-mind when it becomes relevant to an employee’s situation. If you are offering an education assistance program, it’s important to make sure your employees know about it when they need it most. Here’s how your organization can promote your scholarship or tuition assistance program(s) to employees – and ensure they take advantage of this valuable benefit. Use your company Intranet and newsletter. Want to start or manage your education assistance program? Learn more here. Send mass mailings informing employees of their educational assistance options. Display information in company lunchrooms, entrance areas or other common areas. Place table tents on tables in break areas. The more people know about a program the more successful it will be. If your program isn’t meeting your goals — or if you have additional ideas to promote a program — contact us. Scholarship America’s experienced program experts are happy to ensure you’ve got a custom marketing and communications strategy that speaks to your employees.